Dry Needling is used to treat various different injuries from muscle strains to low back and neck pain. Dry Needling involves the insertion of acupuncture needles into muscle tissue to help relieve muscle pain and soreness. Each acupuncture needle is inserted into the skin and muscle directly at a myofascial trigger point – where a physiological response occurs and helps to relieve pain and spasm. All of our physiotherapists are trained in dry needling and we offer this in conjunction with our regular physiotherapy service. Generally, dry needling does not hurt – you may, however, feel a prick or pinching sensation as the needle is inserted and removed. 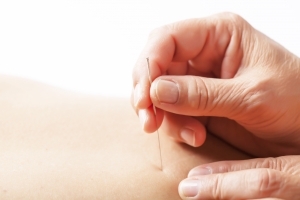 Acupuncture is based on the traditional Chinese eastern medicine approach to health. It focuses on pain meridians and the flow of chi in the body. Dry needling is the modern version of acupuncture that targets specific muscles and joints and is used in conjunction with other physiotherapy treatments/modalities.